This New Study Material is available for the Students who are registered under Old Syllabus [i.e. 2007 Syllabus] of Company Secretaryship of ICSI. 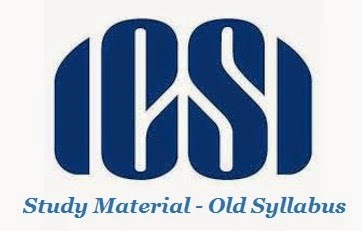 Institute of Company Secretaries of India (ICSI) has issued New Study Material for its students registered under old Syllabus of CS-Executive, and CS-Professional Programme. The edition has been issued by ICSI for the Students who have received the books under old edition and pursuing Examination under Executive Programme and Professional Programme. The Institute provides the study material on all subjects for the better practice of the students for upcoming examinations. CS-Institute issued the Supplement material also for the students who carry the study material of 2013 Edition and going to appear in December-2014 Examination. The Study Material has been issued on ICSI official website [www.icsi.edu] for the students of Foundation Programme, Executive Programme and Professional Programme. the subject of the Programme"